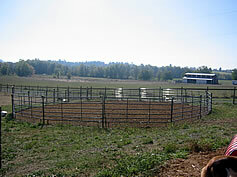 Rocking Dog Ranch has many different fields and arenas for herding. The 60 foot round pen makes an excellent area to start dogs out. A small 30' x 50' arena and a 300' x 20' runway, encourage dogs to learn how to work in tight places and make nice transition areas as dogs begin to progress to the open fields. 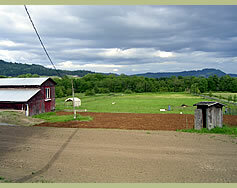 Two 200' x 300' fields are available for dogs ready to begin training for bigger outruns and field work. AHBA, ASCA, and AKC trial runs can be set up in these fields for practice. Lastly, Rocking Dog Ranch has a 4 1/2 acre field for the bigger outruns and more challenging field work.